Ayam Kalasan is Javanese spicy fried chicken. The chicken is cooked twice; i.e. first simmer in liquid then deep fry or shallow fry. The boiling liquid is rather unusual using the clear juice inside the coconut not coconut milk. I change the second cooking stage by grilling rather than deep frying, which is easier, healtier and less messy. The result is equally good, chicken is tender and full of flavour. 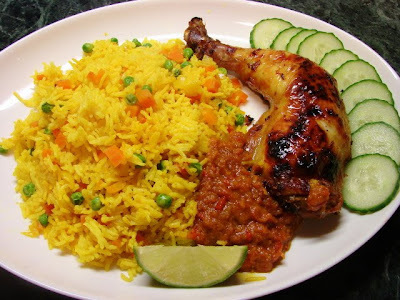 To go with this chicken is a sauce made with the remaining cooking spices (see recipe) and a fragrant spicy yellow rice. * Coconut juice is the clear water inside the coconut. To get this juice crack a fresh coconut and collect the juice. Young coconut juice is better and tastier. If not available use standard mature coconut. Or if you can find coconut juice in a tin/can use one which is unsweetened. ** Salam leaf is Indonesian bay leaf (not the same as English bay), I have never seen this in England so I leave it out. First prepare the spice paste, put all in a mini blender and ground to a paste. Put the chicken, salam leaves and spice paste in plastic bag and mix well. Leave to marinate for few hours or over night in the fridge. In a large saucepan or wok, heat the coconut juice till boiling then add chicken and all the spice paste, gently simmer without the lid for about 25 minutes, turning once or twice till the liquid has almost all dried out. Don't worry if the chicken is not cooked through yet. Take a roasting tray line with foil and put on a rack, put the chicken on and grill on high heat for about 12 - 15 minutes each side till the chicken is golden brown. There are still few tbsp of spice paste left on the pot/wok after cooking the chicken, add tomato to it and cook for about 10 minutes till the tomato is reduced to mush and the sauce is thickened, season with salt if required. Serve this sauce with the rice and chicken. ***Fresh turmeric gives a better flavour and colour. I grate the turmeric (without peeling the skin) straight from frozen using a Microplane grater. Rinse the rice and drain off water. Using a large saucepan with a lid, heat the oil and fry onion, carrot, turmeric, chilli powder, star anise, cinnamon and clove for few minutes till fragrant and vegetables are softened. Add water, vegetable bouillon, salt and rice. Cover and bring this to the boil. Then turn the heat to low and simmer till all the liquid is absorbed. Continue simmer at lowest heat for another 5 minutes. Put the peas on top. Lid back on and simmer for another 5 minutes. Heat off and leave for another 12 - 15 minutes before serving. Then loosen and mix the peas into the rice. Ready to serve. Can also add some sultanas/raisins to the rice if you like. For a more fancy way to serve this yellow rice on its own, pile the rice on a large plate, sprinkle/garnish with any of these additional ingredients likes deep fried shallot rings, dry roasted grated coconuts (kerisik), toasted almonds, finely shredded thin omelette, hard boiled egg (sliced or quartered), cooked prawns, more peas, sultana and chillies, cucumber slices etc..
**** If you hate biting into a hidden clove in the rice, look for them when loosening the rice before serving. As the the picture shown above, serve chicken with rice, sauce, sliced cucumber and a wedge or lime (optional). Looks good. I love Javanese rice. thanks for sharing the recipe.